Carpe Memoria: Take Wing Blog Hop! 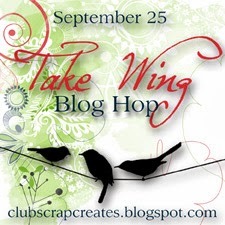 Welcome to my blog and thank you for following the September 2013 Club Scrap Blog Hop featuring the Take Wing collection! The starting point of the hop is Club Scrap Creates. There you will find the list of participating bloggers who are all creating with this cheerful kit! My creation is a card featuring the collage image from the Borders & Backgrounds unmounted (UM) stamps. The technique came from the creative team at Technique Junkies and is found in their August/September 2013 newsletter. Their newsletters are full of fun and creative techniques, and they have CDs with tutorials, too! You can visit the TJ blog at http://techniquejunkies.blogspot.nl/. This technique is called the Blocked Backgrounds Tutorial. Step 4: Again, repeat the stamping, this time in the lower right quadrant. Notice that I used the same two Post-It notes in each step. I'm a frugal crafter! Step 5: Using a Sharpie pen and clear ruler, draw lines around each block, like curbs around city blocks. My corners are not perfect (see the previous paragraph). I knew I was covering the intersection with a cut-out, so I wasn't too worried about it. The "Blocked Backgrounds" panel is complete. Not shown: Edge the panel using a black stamp pad. 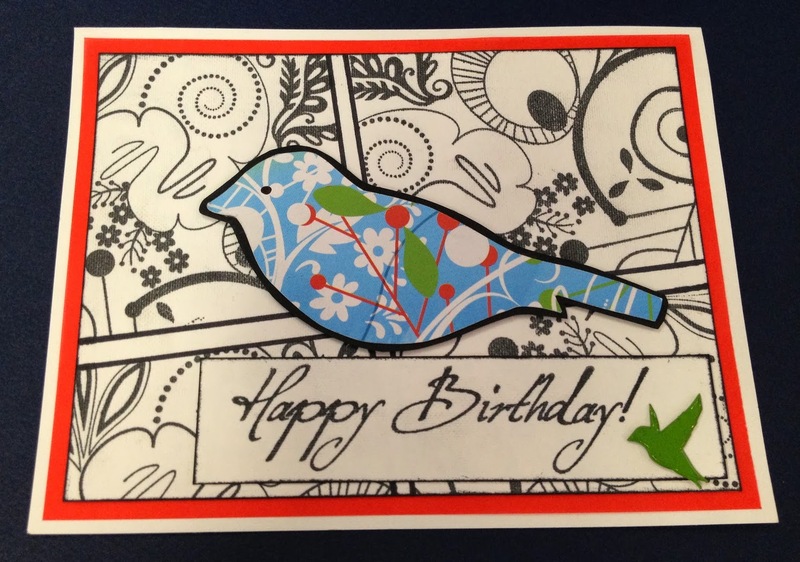 To add a focal image to the card, I chose the bird from the Take Wing collection stencil. I moved the stencil around on the printed paper (below). Since I was using the Red Translucent paper behind the stamped panel, I chose the section with the red "branches." The printed bird blended in too much with the background. Adhering it to black paper not only added contrast but also made her just a bit bigger. And adding dimensional tape raised her off the panel. Below: A simple white panel for the greeting doesn't detract from the artwork. I'm so glad you visited my blog today, and I hope you give this fun background technique a try! 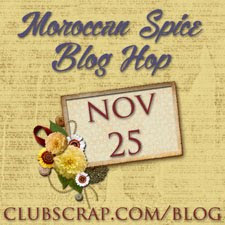 Your next stop on the hop is Marya's blog. Continue hopping along to see more creativity with Take Wing! 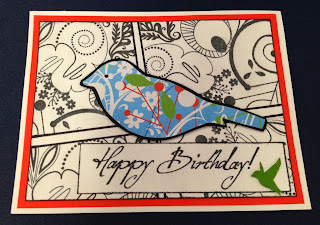 I'll have to cut out my stencils now, what a great idea and bright cheerful card. Thanks, Debby. The bird is such an easy one to cut out. And I just love her using the printed paper. Lisa, you did one of my latest favourite techniques fromTJ. I just love how you made this card. Super cool! CS has so many collage stamps that would work great with this technique. It's a fun one! Such a lovely card! Thank you for all of the details on how to re-create. The bird created from the stencil is a fabulous finisher! Thanks, Tricia! That printed paper is fabulous!! Awesome card, Lisa! Great detail and I love the collage look. Thank you, Karen. I did something else with the other UM set we talked about--I'll post that one later this week. Wow cute, I wonder if I could just leave work and go home and replicate all these ideas this afternoon? Thanks! Isn't this a fun kit?! Lisa, this is such a great technique. I need to try this one for sure! Wonderful card! Really love the bird, I have been meaning to cut one out and make a card as well, now seeing yours I know I MUST find the time, so nice! Neat card - the bird really pops on the b/w background! Lisa congratulations on your first participation in the blog hop. Your card is tremendous and I already bookmarked it for casing. So cool Lisa! Love the black and white background and the pop of color with the bird. Will have to try to recreate this technique soon! I love, love, love the blocking technique! I'm gonna have to try this SOON! Wonderful card! I haven't tried this technique yet from the newsletter. Thank you for showing how awesomely easy it is. Great card and tutorial......thanks for the inspiration and sharing. Love your card, great project; tfs the details! Luv this card , the black and white looks great ! Love your card - will have to try this technique out!! Wow, this is really cool, what a great look! what an awesome card! I'm gonna have to try this, digitally! Great technique for that stamp - the card is absolutely lovely! Great stamping technique - I'm going to try that.